So...I forgot to post one of these last week! Derp! I would have reported two pounds lost and shown you a bad photo of some fruit. We didn't miss much, did we? This week I've lost another two pounds! That makes 11 pounds down so far! I also have actual cooking to show you. My topic for this week is a quick look at how to tweak a recipe so you can eat with your non-dieting friends or family. I made quiches! Last year I made a point of cooking a real dinner most Thursday nights, to bring the three/four of us together for a sit-down (in front of the tv) meal. I got out of the habit around xmas and this week I felt like I needed to make the effort again. Counting points can make this kinda tricky. Two of the other three people in my house are picky-ish eaters, so they don't always want things made in a way that I can fit them into my day's points. I considered tacos, one of Zeus's favorites, but I realized that I'm out of WW-friendly tortillas. Quiche is another of his favorites, and even easier to adapt. I swapped fatty bacon out for lean deli ham, cream out for fat-free evaporated milk, and I made mine crustless and went light on the cheese for that one. 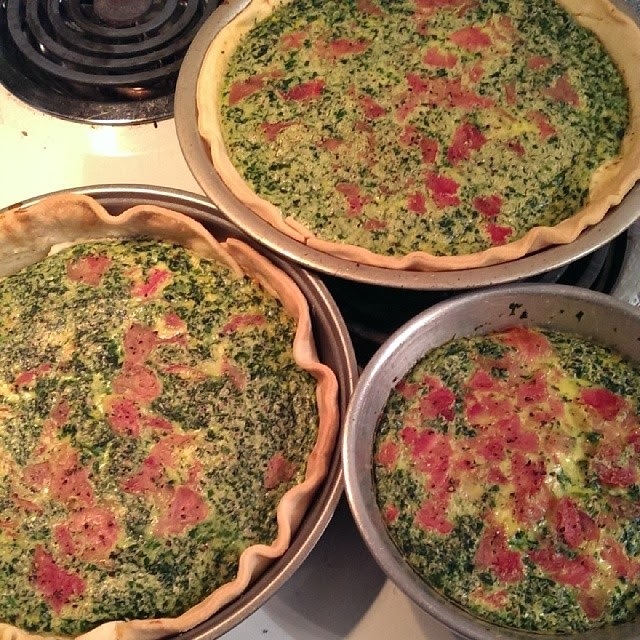 I estimated the whole small quiche I made for myself as around 10 points. Delicious, easy, and really adaptable! I can see myself doing this again pretty soon. Adapting recipes to cut calories, carbs, and/or fat really just comes down to thinking of substitutions. Eating well doesn't have to mean living on salad and putting aside favorite foods, especially with all of the reduced calorie/carb/fat/sugar/whatever stuff you can get now. I eat adapted versions of favorites more often than anything else, I think, especially in the winter when most produce is sub-par and expensive. The fish and chips I had a few days ago is another good example. The fish was Van De Kamp's 90 Calorie Crunchy Fish Filets. They taste pretty good, since it's still the same white fish as in most of that kind of thing. They're just small and thinly breaded. The fries were steak-style, which are almost always lower in fat per portion than thinner cuts. It's all about knowing your options and checking the nutrition panels. When it comes to cooking for a group, the same ideas still apply. Swap what you can, make yourself a slightly different version, have a little of what they're having and round your meal out with salad or fruit, etc. I know some of you are working on your eating habits too. Hope it's going as well for you as it is for me! I'd love to know how it's going!